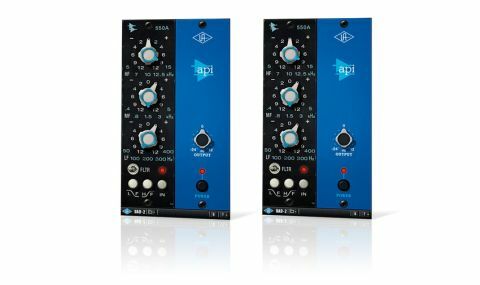 Among UA's most impressive analogue emulations yet, these are two truly beautiful-sounding EQs. Impressively accurate recreation. Superbly musical low- and mid-range EQ. Simple to use and get results from. Colourfully adds edge and retains focus. Open, pristine top end. Has originals' limitations. Mildly annoying dual concentric knobs. Introduced in the late 60s, API EQs quickly became a worldwide industry standard, despite the fact that they're about as simple as EQ gets. UA's API 500 Series EQ Collection (VST/AU/RTAS) for their UAD-2 DSP system covers the two most sought-after API models: the API 550A Parametric and the API 560 Graphic. The 550B 4-band parametric, though, is noticeable by its absence. "It was the sound that won the APIs their following - they were tough, punchy, tight and open"
You can't do much in the way of surgical tone-shaping with a 10-band graphic or a 3-band parametric that has only a handful of frequency choices; no, it was the sound that won the APIs their following - they were tough, punchy, tight and open, making the squat 3U high units a common sight in both consoles and bespoke 'lunchbox' racks. The 550A features high, mid and low bands, each with +/-12dB of cut/boost and only five centre frequency choices, which have been selected for their musicality rather than their calculated numeric intervals. The gain and frequency controls on the original hardware use a dual concentric arrangement, with the frequency selector being the inner knob. It's a fiddly arrangement, particularly for fat-fingered folk, so you'd hope that a software version would address this issue. The concentric knobs themselves are still here, and still a tad fiddly, until you realise that you can hover the mouse pointer over the inner (frequency) or outer (gain) knob and simply scroll the wheel up or down to adjust it. You can also jump straight to a frequency by clicking it. By default, the top and bottom bands are bell curves, and there are individual shelving options available for each. There's also an FLTR switch on board, which engages an overall band-pass filter, allowing only frequencies between 50Hz and 15kHz through. In line with the literal nature of these models, the gain knobs have the stepped 2dB increments of the hardware. A non-stepped option would have added to the precision, as would a continuous frequency control, but the latter, particularly, would have taken the plugin away from the defined sound of the original. And on that subject, the sound is remarkably close to the original, especially the tough lower mids and open top end. It's always well focused and clean, regardless of how much boost is applied, unlike many EQs, which can become blurred and abrasive as the boost rises. The API 560 graphic EQ is more straightforward than the 550A. The ten bands are each an octave apart, starting at 31Hz. Unlike most octave graphic EQs, though, this one sounds really tight and punchy, and is great on kicks and basses. Like the hardware original, there's a 1.5dB boost over unity in bypass, so don't be fooled by this cheap (but faithful) bit of trickery. The gain for each band goes to +/-12dB but sounds like much more when you take it to the extremes. Finally, there's an Output control for evening out the levels. The famed API power and punch are immediately evident in both plugins - we have to say that the Waves equivalents pale into insignificance in the shadow of these vastly superior emulations. The focus is impressive and the sound positively leaps out at you. If you're one of those sonic cynics who thinks all EQs sound the same, take these for a demo and prepare to be enthralled.